It’s no secret that I’d rather be wearing a dress over jeans. We all have pieces that we feel the most comfortable in and for me, it’s always been dresses. But that isn’t to say that I never wear pants. I used to hate wearing jeans because I could never find ones that were both comfortable and fit me right, but over the past couple of years, I’ve figured out the styles, fits and brands that work best for me. I had a huge stack of denim in my closet and recently purged all the pairs that I don’t wear often, leaving me with a nice pile of ones I love. My Darkest Wash– This J.Crew pair is my ‘dark’ denim that I’ve had for years. The fit is really great and I love that they’re so simple and clean. My Most Worn– I love Frame jeans and they’ve really become one of my go-to brands for denim. This pair in particular has been a favorite of mine for a few years and I still find myself wearing them as often (last seen here). My Cropped White– I don’t think I’ve ever found a pair of white jeans that I truly loved until I tried on this Everlane pair. You’ve probably seen them on the blog before at least a few times like here, here and here. My Slightly Distressed– In the past I’ve bought a few pairs of ripped-up boyfriend jeans, only to let them sit in my closet. I realized that while they look good on some people, I wasn’t one of them. Instead, I have this pair of slightly distressed jeans that I find extra flattering and fit my personal style much better. 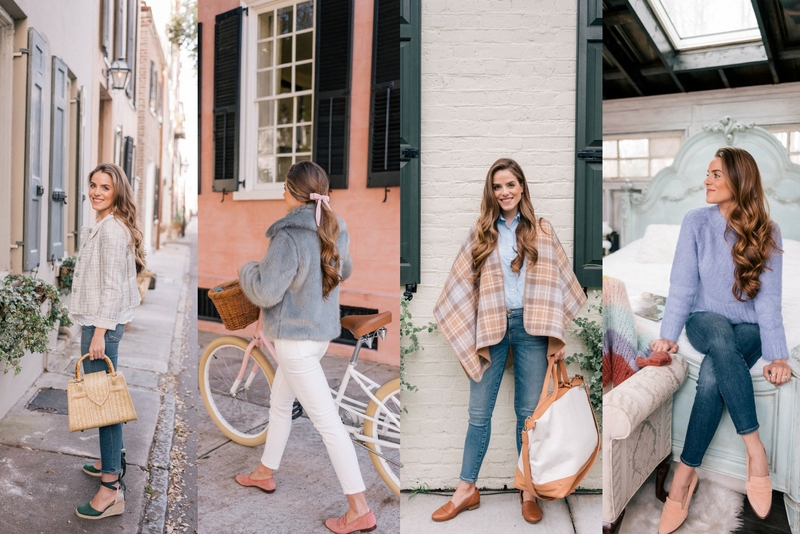 My New Favorite– I love the wash of my newest pair of denim from J.Crew and have been wearing them a lot recently as seen in my daily looks here, here, here and here. You could not have posted this at a more perfect time – I’ve been searching and searching for a new pair of jeans – can’t wait to give a few of these pairs a try! Stunning, Julia. Love your jean selections! You piece together the loveliest hues. I love this Julia! I’m so in love with denim, like my jeans collection is a little bit out of control! Ha ha! For me it is the same – I prefer also dresses instead of jeans :) Therefore your guide is for me, thanks a lot! I’m dying to try Frame and Everlane jeans. I am a dress girl too! But denims have their own utility! Jeans are my favorite category of clothing and loved seeing your top picks! I’ve been wanting to get my hands on a pair of Everlane denim and love the looks of the Frame ones you picked. Right now I am obsessed by my Redones and Mother. Loving this list!! Finding a good pair of jeans makes such a big difference! I’ve heard great things about the Everlane denim and need to for sure give them a try! I have been on the hunt for new jeans! Definitely going to try some of these! Great list of denim! I just purchased the everlane jeans and I am obsessed. They really are SO good. What a great post! I need to find my perfect pair of denim, so this is a good start! Julia, what’s the sizing like with Frame jeans? I would like to get a pair. What size are you wearing? Thanks! You look great in jeans! I have found the one brand of jeans that I LOVE and fits me perfectly – Abercrombie and Fitch! LOL! So many girls look good in denim but I always feel so sloppy! I’m going to have to emulate some of these looks! Your pictures are so gorgeous always!! Loving all your choices! You do a great job of incorporating denim into a very feminine wardrobe. White jeans are the hardest jeans to buy in my opinion! I have been wanting to try Everlane’s white jeans for a few months now. I am saving up to try them this Spring/Summer, so hopefully they pass the test!I . I <3 how you styled the J.Crew jeans and I totally understand you on the boyfriend jeans. I have two pairs and they just seem to fall down my shapeless body when I wear them. You are the queen of dresses and I love that about you! I have an obsession with dresses hence why I dread winter haha! Thank you for your denim guide. So helpful because I am in serious need of some new pairs! I love this post! So pretty! Where is the cape from? Great post! As someone who lives in jeans, I’m glad to see a post on it. Jeans are one of those hard things to shop for, a pain really, but I’ve discovered that Hollister and Abercrombie jeans work best for me. They’re tight and stretchy. Fellow dress lover here! Jeans are definitely not my cup of tea because the fit is always off. But I think I just need to keep searching for the perfect pair! Will check out these recs! Thanks for all these denim recommendations! I’m so glad to see those white jeans from Everlane on your list! I’ve been trying to find jeans that fit well forever, and have been considering ordering a pair from them. Thank you for this post! I’ve been looking for a darker but slightly faded pair and your new favourite is just what I am looking for! I am so guilty of buying jeans that everyone else is wearing but don’t actually fit my own style. Thankfully I have also purged my closet due to a recent move so know I have about 5-6 pairs I love! Also, I have been hearing great things about the Everlane denim line and I think I need to try it out ASAP. Your white pair is so cute! Love all of your selections! I love a good cropped jean! I am the exact same! I never feel good wearing jeans and I honestly wish I could wear a dress every single day. It’s a little hard to do that here in Calgary becuase of the freezing cold weather in the winter. I’d love to try some of your favourites! Jeans look great on you, but they might not be for everyone! I don’t have diverse enough of a collection, but hopefully I’ll be prepared for the spring! I love the title of this post and that poncho you are wearing is perfection! I will have to try Everlane jeans. They look great on you! I might have to follow your lead and clean out my closet. I wear the same jeans all of the time and don’t need to keep the other ones around! I seriously love all of your outfits! You look amazing! Love this guide, Julia! I need to try a pair of Frame denim — I’m usually a Rag & Bone kinda girl! That’s a great variety of jeans! I personally love to wear both jeans and dresses! I used to adore jeans but more recently I’ve found myself reaching for trousers more and more! These pairs are so pretty but I feel a little over the skinny. Do you have any recommendations for straight leg or a slightly wider fit for denim? I love this post!!! I rarely wear jeans as I am more comfortable in dresses too so this was interesting to read. The only thing is that I am more curvy on the bottom so not certain your favorite jeans will be good for me. However, it’s always enjoyable to see how you style outfits!! I need to get me a few pairs of these! They are all so nice. White cropped denim is probably my favorite style of jean- I love how versatile they are. Also I am all about the topshop jean- I could never fit in any jeans but the these are so stretchy they fit like a dream. Such cute outfit ideas and I love your photography skills! So pretty and feminine. I love your style.White cropped denim is simply my favorite style of jean- It’s a great pleasure to see great post from you. Love your jean selection. Thank you for the references. I’m obsessed with the plaid cape and don’t see the source. Can you send where you got it??? I love how you styled all the pairs. They all look so cute.